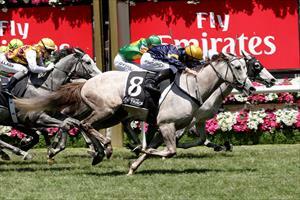 Tribal Wisdom continued the good run of form for Ballymore Stables with a sensational win at Flemington on Oaks day. Patrick Moloney had to change his plan after finding himself behind a wall of horses early in the home straight but he did not panic. Eased into clear space but with ground running out, Tribal Wisdom flew late to make up several lengths and get up in the final stride to land the Off The Track Subzero Handicap over 1400m. Moloney said his plans to use Tribal Wisdom's speed from the barriers went out the window after a slow start. “I tried to use his natural speed from the outside,” Moloney said. “He didn’t step all that well, so I went to plan D and moved back to the fence. “I was on the back of John Moloney’s horse and I thought I was going to be in real trouble. “I had to switch across again and he had a big task ahead of him, but he thought he’d do a bit of showboating in front of his grey friends today. Moroney said he feels the son of Makfi is still learning his craft. “He’s very lightly raced, so he’s still learning what it’s all about,” Moroney said.